My dad had a large collection of books on vampires that he had accumulated over the years, and was always keen to share his love for this immortal monster with me. I can distinctly remember being the only kid in first grade that knew who Vlad the Impaler was and being the only kid in second grade that knew who VARNEY THE VAMPIRE was. I was bitten early by the monster bug but, because of my stubbornness and shyness, it was quite a while before I befriended a fellow monsterkid. 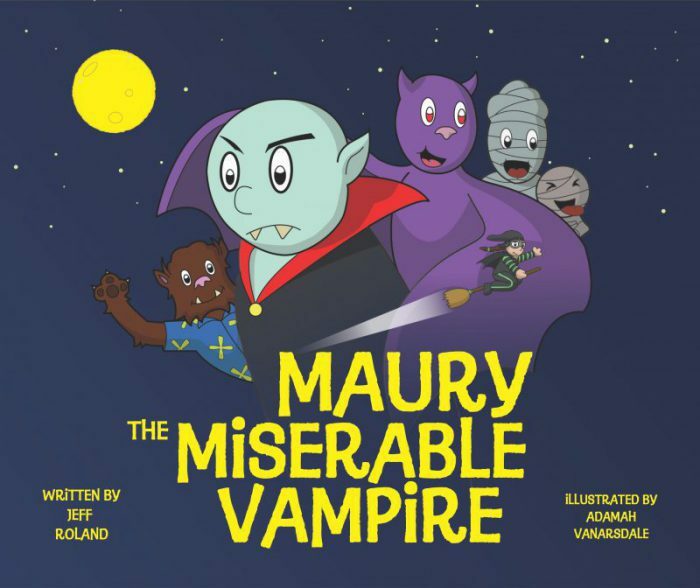 In this edition of FRIGHTS FOR TYKES I’m covering MAURY THE MISERABLE VAMPIRE written by Jeff Roland, Illustrated by Adamah Vanarsdale and published by Jeff Roland in 2018. The book follows a little bloodsucker named Maury with a less than amicable disposition, as he undertakes to find his one and only friend: Barry the Bat. Along the way, Maury gains new friends, new experiences and a new sense of belonging and courage. MAURY THE MISERABLE VAMPIRE is a whimsically illustrated and tenderly written book for kids, specifically (but not exclusively) for kids who have trouble stepping out of there comfort zone. As a kid I HATED to try new things and HATED to make new friends. I imagine if I had a vampire like Maury in my life, I may have come out of my belfry a lot sooner. MAURY THE MISERABLE VAMPIRE can be purchased directly from maurythemiserablevampire.com for $12. If you order it there you can request it be autographed! The book can also be purchased on AMAZON for $12 + $3.99 shipping. No matter your child’s level of flexibility and outgoingness, I highly recommend that you invite Maury into their lives. He’s got a valuable story that’s every budding monsterkid should hear!